Never been much of a guitar guy. Bloody hell Nyx, getting gold stars on vox for Cedarwood Road is driving me crazy!!! well done! That I've got no worries with. Cold Clear Light is RB4's Tangled Up in Blue. Got tonight, but that is the hardest one so far for me. We need some PS4 players!! 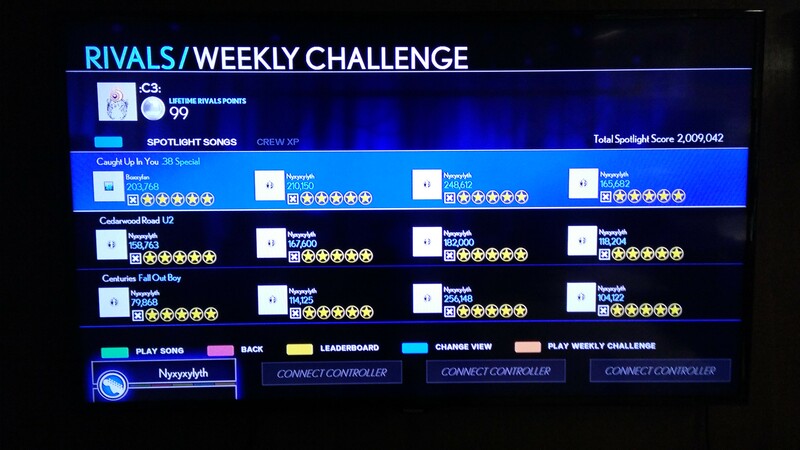 Rockrew has also been promoted to Gold and we really need an expert drummer because the real challenge begins. Feel free to join, we're on Xbox One. Quoting myself here incase anyone new might see. We're about to promote to Platinum tier, but it's still just 4 of us, and at that rate, it's impossible to compete. Who wants to join a crew? I've been going ham this week and it's a rough go with my PS4 crew only having 2 people. Lol. Soon to be three hopefully. We're a platinum crew and we are now looking for one more member as we are 9/10. Ideally we want the person to be from these forums, it doesn't matter what instrument you play, just that you contribute most weeks but ideally every week. A big library is a definite plus. Message our glorious leader Funkydunkleman for an invite. Hail to the mighty 'Dunkleman, Shredder of Notes and Commander of Breadsticks. I'm in. I'm a friend of rockin rindy. I got the Xbox one. I wasn't even checking this thread. I had just accepted you from the app. Glad you're with us.